Thomson Cruises has joined forces with I’m a Celebrity favourite Larry Lamb to create a series of online videos in which the actor is tasked with challenges while sailing in the Mediterranean on new ship TUI Discovery 2. Managing Director of Thomson Cruises Richard Sofer said: “We knew that Larry had a love of travel and meeting new people – made evident by his ability to speak five different languages – making him the perfect person for our Cruise Mates challenge. “It was great to see him really get into the spirit of the trip, meeting an array of fascinating locals who bring to life the different destinations that TUI Discovery 2 visits. A series of three films all follow Larry’s adventures in Barcelona, Palma and Ibiza, as the star stepped on shore to explore what each destination had to offer, meeting an eclectic and diverse mixture of vibrant people who all have a story to tell – known as ‘Cruise Mates’. Larry’s challenge to meet remarkable native people follows a recent world-first study from Thomson Cruises and the Human Nature Research Lab at Yale University, which proved that Brits who bond with up to five new people from different cultures while on holiday can experience a happiness boost of 10 per cent. The first port of call was cosmopolitan Barcelona, where Larry set off to discover the city’s most authentic arts and culture. He explored the world-famous Boqueria market, where he began chatting to Junaito, the owner of Bar Pinotxo, which he runs with his nephew. In Palma de Mallorca, Larry was keen to discover a selection of outdoor pursuits within the historic and vibrant city. As a world-renowned destination for cycling, Palma sees pro-athletes visit the town for its perfect flat terrain and warm climate. After wandering along the picturesque seafront, Larry took up a local recommendation and met Thelonious, a Mallorcan born cycling and hiking expert. In his final Cruise Mate destination and inspired by his upbringing in a fish and chip shop in London, Larry went in search of the freshest seafood on the bohemian island of Ibiza. 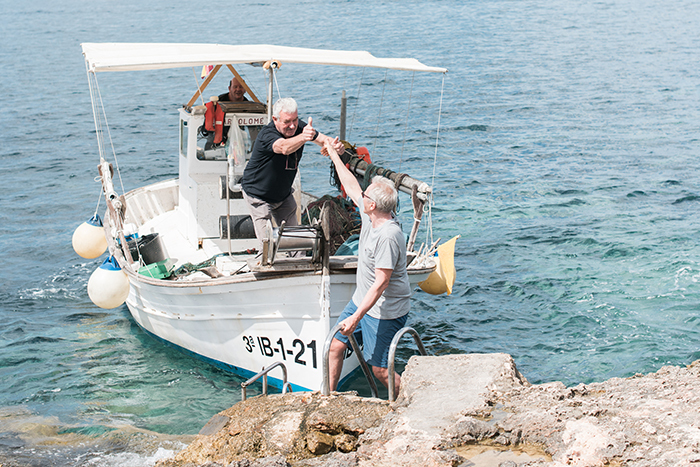 After veering off the beaten track, Larry arrived at a typical Spanish fishing harbor and met local fisherman Miguel, a native Ibizan who grew up in a traditional fishing family. Following his trip, Larry said: “I have been lucky enough to travel the world during my career, meeting a diverse group of people from across the globe, but I’ve never had the opportunity to experience a cruise. “After spending a week on TUI Discovery 2, I learned that cruising really is an incredible way of seeing the world, meeting new people and broadening horizons.